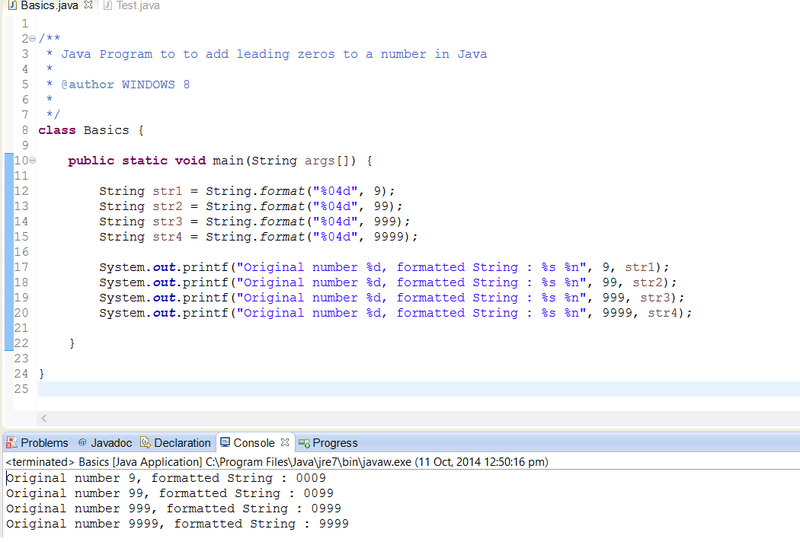 Earlier we have learned about formatting floating point numbers in Java and that knowledge is going to help a lot. There we have learned about using both String.format() and DecimalFormat to create floating point number up-to two, three or four decimal places. If you have read that article then you are already familiar with tricky formatting instructions we pass to format() method e.g. "%07d", in this article we will learn how to left pad an integer value in Java by adding zeros at in front of the number. Let's take a hypothetical example of a legacy system which accept a terminal id which can be anything between 1 to 9999, but requirement is that input must always be 4 character long e.g. you cannot pass "9", "99" or "999" instead you need to pass "0009", "0099" or "0999". So you need to either write a routine who is smart enough to add right numbers of zeros in front, as it varies depending upon input, or you can simply use String.format() method to do your job. Here is the code, which will always create a 4 character long numeric String, and it will add either 1, 2, or 3 zeros to make final String 4 character long. d is for decimal which means next argument should be an integral value e.g. byte, char, short, int or long. You can play with this code by changing each of these meta data to get a feel of it. For example you can change the length to pad more or less zeros e.g. %06d will always create a left padded numeric String of six digit. By the way, while using String.format() method you must remember that formatting is locale specific. This version of format() method will use default locale, returned by Locale.getDefaultLocale() method, which is mostly Locale.US, but if you are writing an application where internationalization is used e.g. an Android app available in different countries and in different language, you should consider using overloaded format method, which takes Locale as parameter i.e. format(Locale locale, String format, Object... args). This way you can control how your formatted numeric String will look like depending upon the locale. Here is a screenshot of how this method add zeros at front of various input you can see that it adds right number of zeros smartly depending upon number of digits in input. Our last example is good enough to create a left padded numeric String but unfortunately it was only available from Java 1.5 onwards. What do you do if your application is still running on Java 1.4, of course you will cry for update to at-least Java 1.5 until you are tired of asking it. No need to be disappointed, Java 1.4 has DecimalFormat to help you out. Following code will add leading zeros to the input number, if number has less than 4 digits. Here we have created formatter with four zeros which means it will always return a four digit numeric String with zeros in front. So if your input consist just 1 digit say 9, it will return 0009 as show in first example, if your input contains 2 digits, it will return 0099 and if your input contains 3 digits it will add just one leading zero on start. If you pass a four digit number it will not add anything. You can try these examples or let me know if you have any trouble executing them. Here is our Java program to demonstrate how you can left pad a number with leading zeros in Java without using any third-party library like Apache Commons or Google Guava. There are two main ways to add zeros at the start of an integer number in Java, first by using format() method of String class, and second by using format() method of DecimalFormat class. String.format() is my preferred solution because of it's extensive usage but it is only available from Java 1.5, so if your application has stuck in JDK 1.4, you cannot use it. For those warriors, I have shared how you pad numbers using DecimalFormat. By the way padding is a part for formatting and if you are familiar with formatting String in Java, it would be very easy to understand. In first example we have used String.format() to convert 220 to a 8 digit long numeric String, "%08d" will create 8 digit long String. You can also add leading zeros in hexadecimal numbers by using "x" instead of "d", as shown in next example. This example is the same we discussed in our DecimalFormat section, it creates numeric String of length 6 with zeros in front. * This method returns a String which contains padded zero. // be padded by leading zeros. That's all on how to add zeros at the beginning of a number in Java. You need this kind of padding while working with financial systems and some legacy system, which accept input of certain length. Thanks to Java converting an integer to String is not a big task but formatting String is still tricky, hopefully by following these examples, you will get hold of one of the more useful concept of formatting String in Java. By using these methods you can easily pad as many zeros as you like because String has no range in Java. By any chance if you are stuck with Java 1.4 you can use DecimalFormat to do the job (second example) otherwise prefer String.format() method of Java 1.5 because it also has lots of other usage and being comfortable with this method helps a lot. As I said, formatting is very useful concept and you must master it. You will often find yourself formatting date and time or dealing with formatted numbers in Java. A good grasp of formatting instruction will help you a lot. isn't padding is just opposite of trimming? then if we can have a trim() method on String class, why not we can have pad() method as well? or may be left_pad() and right_pad() to apply padding on left or right side of String.